The ASPCA Animal Poison Control Center released a list of the most common pet toxins they received reports about in 2017. Pets are curious—it’s part of what makes them so lovable. However, that same inquisitiveness can be dangerous, especially when the target of an animal’s interest is a cleaning product, medication or food known to be poisonous to pets. Because how do animals investigate new objects? They eat them, of course. In 2017 alone, the ASPCA Animal Poison Control Center (APCC) received 199,000 cases concerning possible pet poisonings, a 10% increase from the previous year. To help raise awareness about potential hazards in and around the average home, ASPCA APCC released a list of the 10 most common pet toxins it received reports about last year. This list serves as a great point of reference for veterinary clients, as well as veterinary team members who may be taking a patient history to understand the cause of illness in a pet. Fertilizers and other gardening-related products accounted for 2.6% of poison control calls the center received in 2017. 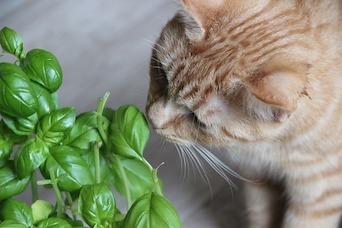 Several indoor and outdoor plants pose a threat to pets, which is why the center received 10,725 reports of possible pet toxicity from plants last year. When selecting plants, choose varieties that are non-toxic to pets, such as African daisies, rosemary, and snapdragons; avoid azaleas, daffodils, lilies, sago palms, and tulips. It’s a no-brainer that rodenticides would be toxic to pets, but more and more companion animals are gaining access to these types of products. Exposure to rodenticides increased from the year prior, which the ASPCA APCC attributes to unpredictable weather patterns causing rodents to seek shelter and food inside homes, in turn, causing an uptick in rodenticide use. Although insecticides are commonly used in homes to kill ants, spiders and the like, their misuse can be harmful for pets. Reports of possible pet poisonings related to insecticides decreased from 2016 to 2017, but still accounted for 6.7% of cases reported to the ASPCA APCC last year. The vast category of household items—including glue, cleaning products, laundry detergent, etc.—appears in the middle of the pack, comprising 8.6% of pet toxicity cases in 2017. Chocolate is a known danger to dogs, yet the ASPCA APCC received 17,540 pet toxicity cases due to chocolate in 2017, amounting to about 48 cases per day. The high volume of possible poisonings related to chocolate is so high that the center felt it warranted its own category separate from all other food-related toxicities. While veterinary products are intended for use by animals, the very flavoring that makes them desirable can also make them dangerously desirable. Animals ingesting amounts of medications exceeding their prescribed doses made up 8.9% of the ASPCA APCC’s cases last year. Many of the foods that fill up your pantry can make cats and dogs severely ill. Still, accidents happen; pet owners either mistakenly share scraps from a meal or a pet somehow finds its way into the snack drawer. The ASPCA APCC points to the popularity of xylitol—which is toxic to animals—in sugar-free items like gum and baked goods as the reason why this category consistently appears toward the top of their list. For the second year in a row, over-the-counter (OTC) medications claimed the No. 2 spot on this ASPCA APCC list. It’s imperative that clients know to consult with a veterinarian before giving their pets any OTC medication, including herbal supplements. Just as with many of the items on this list, exposure to prescription medications is often accidental. Even so, it contributed to 34,888 of pet toxicity cases reported to the ASPCA APCC last year. The center says it most often receives calls about pain medications, antidepressants and heart medications.